Use this item to add the name script under the flap for any style apron which does not include this feature. 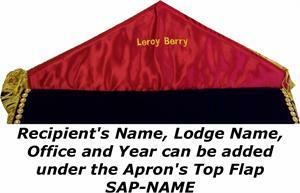 This can be your Name, Title , Lodge Name, or Dates. Enter the copy to be added in the box provided.